1. Federal funds CAN be used to build protected bike lanes. In case any doubt remains, FHWA printed its own design guide for protected bike lanes. It’s okay to use federal money to build them. 2. Federal funds CAN be used for road diets. FHWA created a whole website to help states and municipalities implement road diets that reduce lanes for motor vehicle traffic to improve safety. FHWA wants local agencies to know that federal money can be used on them. 3. Engineers are allowed to use design guides other than the AASHTO Green Book for projects that receive federal funds. The AASHTO Green Book — published by the association of state DOTs — is a behemoth, but its crusty old street design standards aren’t the only game in town. The protected bike lane templates in the design guide published by the National Association of City Transportation Officials are totally kosher. Go ahead and use them. FHWA says it supports a “flexible approach to the planning and design of bike and pedestrian facilities.” That means “It’s not in the Green Book, so we can’t do it” isn’t a valid excuse. Peter Koonce, a transportation engineer with the City of Portland, said this clarification should make designing quality bike infrastructure easier. 4. “Highway” funding CAN be used for bike and pedestrian infrastructure. It’s not only the Transportation Alternatives Program that can be used to fund bike and pedestrian infrastructure, FHWA says. Many other sources of federal funding can be used to support safer biking and walking in the right circumstances, including funds from the huge pot in the Surface Transportation Program. 5. Vehicle lanes DON’T have to be a certain width to receive federal funds. FHWA refers to blanket adherence to typical lane-width standards as “nominal safety,” but using engineering judgment based on the particular circumstances as “substantive safety,” urging engineers to practice the latter. 6. Curb extensions, roundabouts, and trees CAN be used on streets in the National Highway System. 7. Speed limits DO NOT need to be set using average vehicle speed. Another common myth the FHWA addresses is the idea that the speed limit for federally funded roads must be set using the “85th percentile” rule — which means that the limit is based on the speed that the fastest 15 percent of drivers exceed on a road. FHWA calls the 85th Percentile rule “just one part” of an approach that should consider other factors like pedestrian traffic. FHWA has its own tool for calculating appropriate speed limits. “Vehicle lanes DON’T have to be a certain width to receive federal funds” – that excuse was used by the city administration (Dinkins or Giuliani, I forget which) when they removed the bike lane on 6th ave north of 42nd Street after a street reconstruction. 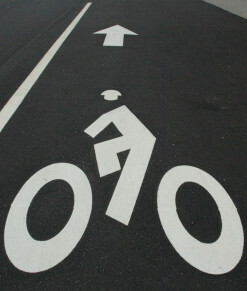 What city did such elaborate road markings for bicycle riders in an intersection shown in the picture? I know it wasn’t the city of Los Angeles, which has never done a intersection treatment specifically for bicycle riders. Pretty sure that’s Vancouver, BC. Great news! Nice reporting Angie. You can also tell it’s Canadian because Canada uses diamond markings to alert drivers that the lane has any sort of restricted/special use (whether that be a dedicated bike lane, high-occupancy vehicle/carpool lane, emergency vehicle lane, taxi lane, etc.) whereas in the US diamonds usually just refer to high-occupancy/carpool lanes. Definitely Vancouver. I know since I took the photo! Find it and related images on Flickr here: https://www.flickr.com/photos/pwkrueger/5133812437/in/album-72157625160007617/ . Politicians and bureaucrats who come up BS arguments in hopes of shutting up the dissent need to recognize that we live in a world of Google fact checking. Any bogus claims that previously people could not just fact check and assumed to be true because of the time and expenses involved to research those matters can now be done at a stroke of a keyboard and takes less than second. BTW, this also goes true for people with vetted special interests or other hidden agenda behind them. Stuff like “I think this is so-and-so, but I offer no proof or data to back up my claims, but you’re going to take my word for it” just doesn’t work anymore in the Google era. Here’s a video I made, visiting there in 2013. Please don’t give U.S. Tax Money to Canadian Traffic Engineers. America sends them enough money for all the filming productioin they steal, and their comedians take gigs from Americans. Bike lanes here in DC also use diamonds, FWIW. Interesting–didn’t know that! As ever, in some ways the US is like 50 (+ more with DC and territories) separate countries with all the differing road signage and rules. Haven’t seen the diamonds for bike lanes here in California or other West Coast states. In fact, that’s more or less the same stencil you commonly see in the Netherlands–go figure. This is off topic, but do you by chance know what kind of helmet she’s wearing? I’m looking for a new one and really like hers. It looks like a Bern but I can’t tell for sure. Complimentary idiot driver footage for everyone too…. I’ve never liked the mushroom head stencil that’s so commonly used in the US. I wish they’d just use a regular stencil of a bicycle, as shown in your bottom photo; this is also what’s used in many parts of the world. After all, the sharrows here all have just a regular bicycle stencil. Amusingly, many of the stencils here are worn to the point where the “cap” of the mushroom has been lost! Thanks for the vid–are you referring to the markings on the speed humps? Looks like a Nutcase helmet. Not sure. The road from which the vid was taken is a ‘bike route’ which is obviously not dedicated. I don’t know if each speed bump in the city is so marked or if this is the indication of the bike route. I’m all for protected bike lanes. Really, I am. I’m just not for the crap that GLP keeps using as examples in EVERY DAMN ONE of its blog posts! That is fine for small cities, like Portland and Vancouver. It doesn’t work in L.A. Our traffic is bad enough. If a lane is taken away from cars for the cyclists, traffic gets worse. At no point will that make car drivers want to switch to cycling. It will just increase their hostility. Respectfully disagree. LA roadways are notorious for being overly wide for the amount of traffic they handle. Not all but many. If NYCDoT can take lanes out of avenues in Manhattan without adverse traffic effects, LA can easily do the same on select streets. I’m not trying to start an argument here (so this is the last I’ll talk about it) but having contraflow traffic to the right of motor traffic on a one-way is FAR from idea or where bicyclists are expected. A two-way cycletrack to the left of one-way motorized traffic is much more predictable place to put contraflow bike traffic. I’m not a big fan of two-way cycletracks at all but if you’re going to show a photographed of a cycletrack don’t show a photo of one of the more questionable designs. Finally, having myself lived in a couple different neighborhoods within Los Angeles I’m well aware of how the presence of nearby walking/transit/bike infrastructure impacted my and my friends’ own modal decisions depending on what was nearby. The data-driven approach is what matters. One of the major contributors to their safety is the full attention given to signalization–cars are banned from turning right on reds and bikes get their own signal. Having biked on both of those stretches I think if there’s anything that’s lacking it’s their subpar width, however. portland did use diamonds as bike lane markings in the 80s and early 90s. some of those are still around. While this post doesn’t indicate that bike facilities are required, it shows that they can be more widely considered Then its up to us in the bike community to make a case for them. In Rhode Island it is a hard sell because years of inadequate maintenance have put so many of our bridges in poor shape and our DOT says they need to give that a priority, and we too have motorists quick to feel sorry for themselves if any other mode gets attention. Better enforcement is the answer, not buckling into driver’s bad habits or feelings of entitlement. What I hear is the state of Ohio requires federal gas tax money to be used for the benefit of motor vehicles only. All federal funds are considered to be gas tax funds.